The Shanghai Evening Post American Edition, Dec. 3, 1943, page 1. The Committee on East Asia comprises a large part of the Area Committees section in MRL12: Foreign Missions Conference of North America Records. 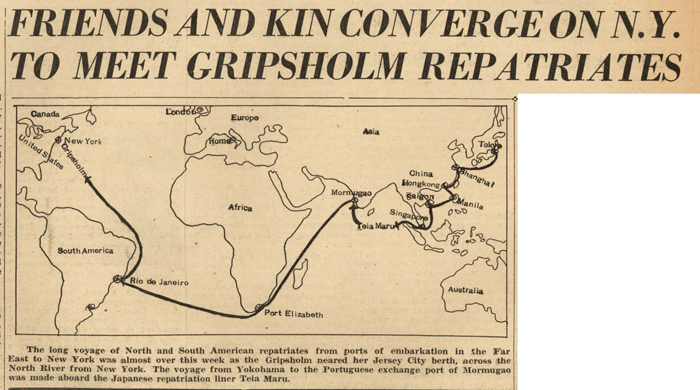 One specific event of note details the Gripsholm Exchange and Repatriation Voyages during World War II (WWII). The MS Gripsholm, a ship that serviced the Swedish-American cruise line and was originally built in 1925, was used from 1942 to 1946 for repatriation efforts by the United States Department of State. A second ship called Drottningholm also helped with these efforts. Gripsholm served under the International Red Cross with a Swedish captain and crew. Making thirty-three trips to exchange women, children, diplomats, prisoners of war, and other nationals between Japan/Germany and the United States/Canada, the ship carried over 27,000 repatriates. 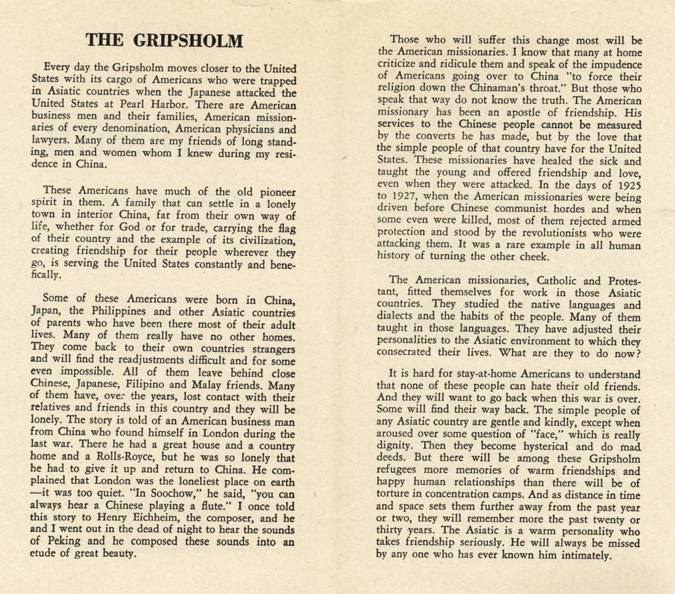 Along with articles and general information on the Gripsholm voyages are detailed lists of Americans returning on the MS Gripsholm. 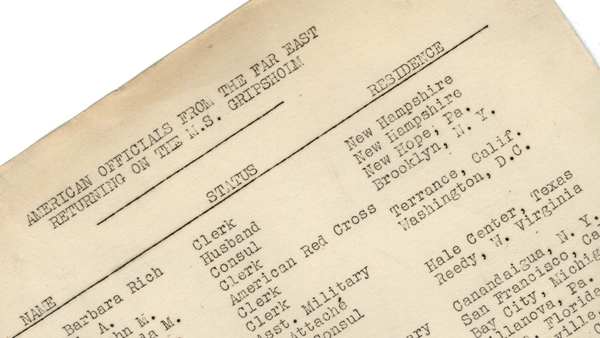 People are recorded in alphabetical order, as well as their status, such as “clerk,” “consul,” “American Red Cross,” or “husband,” and their residence if known. Other documents include lists of boards having missionaries on the Gripsholm, and single letters searching for information on individuals. This entry was posted in Collections and tagged FMCNA, Gripsholm, MRL, MRL12, prisoners of war on September 17, 2012 by Brigette C. Kamsler. This is great, great stuff, Brigette! Keep up the good work. The details and archival materials offered here are amazing! Are there any logs or diaries from the OUTBOUND Gripsholm voyages? Particularly the first one, in 1942? I have a book called “Exchange Ship” that I found on Amazon that details the trip from Lourenco Marques back to the States. My wife (Maria Asayo Ishu) was born on the Gripsholm just outside of the South African port of call. Her birthdate is October 1, 1943, so I think that would have been the second voyage. My father was taken prisoner in Shanghai in 1942. He was a vice consul in the foreign service so he was a diplomatic prisoner. He was later put on the Conte Verde and taken to meet the Gripsholm. He thought he was going home from there but was given orders to go to Vladivostok. I have ben researching this for a while. I have a book called “Exchange Ship” that talks about this period. Along with the Conte Verde the ship Asama Maru arrived in Lourenco Marques to exchange passengers with the Gripsholm. So I have a great reference regarding the Asama Maru, but, I can’t find much on the Conte Verde. Does anybody know of a good reference for that ship and it’s transfer with the Gripsholm? My mother, Mary Smiley, was a returning missionary on the second voyage of the Gripsholm. I recently found a number of newspaper clippings of the events of the time, mostly local to her home town and many without reference of newspaper date or name. Some are from the Kansas (or Hutchinson?) Herald, another from the Pittsburgh Sun-Telegraph, and some from the Stafford Times (I think). Would you be interested in seeing scanned copies of these clippings? Hi Ginny, please email us at burkearchives@library.columbia.edu to discuss further! Hi. I also am doing some research on this particular exchange ship. I am researching a man, to my knowledge a British RAF regular who my grandmother met in South Africa early 1944. Apparently he was a prisoner in Burma? (had a bad back injury that he got from rifle butts) but to my knowledge no-one except a very few managed to escape from prison camps, so the only possible answer I can find as to how he got to South Africa is via this exchange ship (although according to us, he was not a civilian) He left Liverpool in November 1942 for Burma. It says though that it was mainly American and Canadians on board? My question thus is, did this ship stop at Durban port South Africa and unloaded some of the prisoners? Will there be records somewhere of these people? I do not have any more information on him except his name and date of death. Lourenço Marques to Durban is about 400 miles, so not far. There are detailed records of everyone who was on board all the exchange ships. Officials went over and over the lists over months. Having said that, a guy does not just show up in South Africa coming from Burma in the middle of WW2. If this person was a RAF pilot, there have to be records…. Sorry – on the second exchange out of Lourenço Marques, in September 1942, the ship City of City of Canterbury stopped in South Africa. I just came across this–how interesting! My grandparents, Kenneth and Elsie Oliver; my mother, Celia; her brother, Peter; and sister, Alison, sailed on the Gripsholm, departing Haifa on September 17, 1945 and arriving in NY on October 9. My grandmother was American, and Alison had been born in the US in 1926. My grandfather was a British subject, born in Lebanon, and was a surgeon on the faculty at the American University of Beirut. Both my mother and uncle were born in Beirut and had British passports. My father, FL Cannon of the 3rd South African Infantry Brigade, was captured at Tobruk and ended up at Stalag 344 at Bremen. In 1944, he and other very ill South Africans (and allied POWs I think) were repatriated on the M/S Gripsholm to the Uk, and landed at Liverpool I think. In early 1945, he returned somehow to Cape Town – a broken, white-haired 39 year-old. 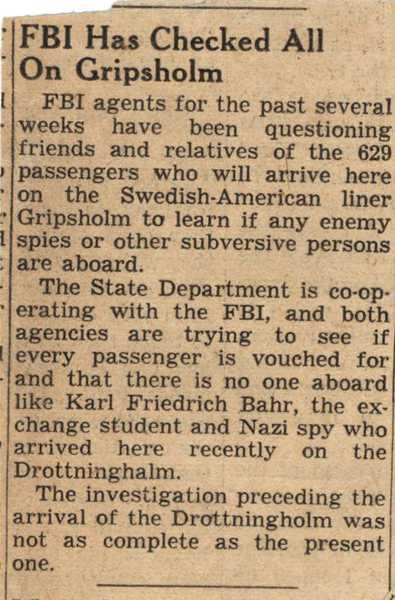 Can you tell me where the departure city was for the Gripsholm that arrived in New York on or about 26 Sep 1944? 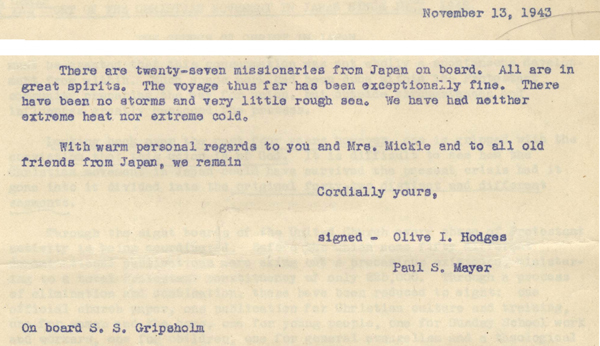 is it possible to get passenger list of the second repatriation voyage that docked dec 3, 1943? My maternal grandparents William and Leada Berst, missionaries in Chefoo China were aboard. One of my cousins is writing a book. My grandmother and aunts, Pieterdina, Katherine and Henrietta Sietsema were interned in Liebenau Germany as US citizens and repatriated aboard the Gripsholm in March 1944. Any further information surrounding their circumstances would be most appreciated. My husband was born in England and adopted by an American Red Cross lady. He was 2 years old when they sailed to New York on MS Gripsholm. We have his Smallpox Vaccination Certificate given to him on MS Gripsholm by Ch Surgeon Kenny on March 17 1946. Is there a Passenger List of that voyage? We would like to see it if possible. Thank You. After research just a few of the blog posts in your web site now, and I truly like your approach of blogging. I bookmarked it to my bookmark website checklist and will likely be checking back soon. Pls take a look at my website as well and let me know what you think. I Wes on the exchange ship Gripsholm in Feb 1944. I would like any information on who we were exchanged for. We left NY Feb 15,1944 and arrived in Lisbon on Feb 25. Actually any information about our voyage to Lisbon as well as the return in March would be great. Also who arranged for these exchanges. Who oversaw them. I was only 7, an American citizen born to German American parents. All three of us were “exchanged”. Wes – contact Dr. Teresa Van Hoy at St. Mary’s University in San Antonio, TX – her students have spent the last year researching the German-American prisoner exchange. She organized a reunion of internees on the MS Gripsholm in Jersey City on Feb 15, 2019, the 75th anniversary of the exchange: https://www.stmarytx.edu/2019/ms-gripsholm/. My mother worked for the US State Dept and was present at the “safe passage” ceremony prior to departure as a 24-year old. She still remembers the German-American families, and getting the the kids access to restroom facilities while they were held prior to boarding. Among those exchanged back to the US were Gen. MacArthur’s nephew and Mary Berg, who published a diary of her time in the Warsaw Ghetto (see Wikipedia). Those sent to Germany also experienced a great deal of suffering. All of this information is from Dr. Van Hoy. My mother was on the Gripsholm trip from Shanghai to Canada on the 2nd trip. She has a vivid memory of going on SAFARI while the Ship stopped in Africa.